Late 2015 saw possibly one of Europe’s most established electronic music houses celebrate their landmark 500th release. 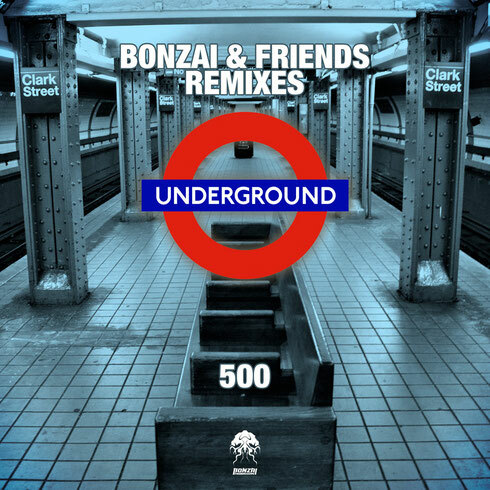 The temptation for ‘Bonzai & Friends – 500’ to stroll through the highest heights of their catalogue - now spanning almost a quarter of a century of musical operations, was strong. The label though went ‘the other way’ and instead of backwards, looked towards the future. They tasked their producer bedrock with the creation of 50 new tracks - ones that would construct as an album as a long-player and a portrait of Bonzai. Now, 20 of Bonzai’s assemblage have picked out their favourite tracks from the original ‘500’ album, returned to the studio and reimagined them. Highlights include ‘Vega Shining’ from Airwave which gets a 10+ minute-long remix companion from Australian Satinka. Airwave himself takes Spaniard’s Alex Vidal ‘Blue Twilight’ on a remix. Having recently dropped his own debut artist album and mix-comps, Audio Noir furnishes John 00 Fleming ‘The Dark Ranger’ with an Odyssey Remix remap. Matt Holliday reconfigures Rick Pier O'Neil’s ‘Signal’ in dark, humid fashion, while Matt’s own ‘Prizma’ receives a remake courtesy of Yuriy From Russia. Crocy waxes galactic on Rise And Fall’s ‘Looking Forward’, whilst Gai Barone produces a dark take on ‘East Café’s ‘Minus Ten’ with his Ode To That Night Remix.